From Middle English band (also bond), from Old English beand, bænd, bend (“bond, chain, fetter, band, ribbon, ornament, chaplet, crown”), from Proto-Germanic *bandą, *bandiz (“band, fetter”), from Proto-Indo-European *bʰendʰ- (“to tie, bind”). Middle English band reinforced by Old French bande. Cognate with Dutch band, German Band, Danish bånd, Swedish band, Icelandic bandur (“band”). Related to bond, bind, bend. A strip of material used for strengthening or coupling. A strip of material wrapped around things to hold them together. The Jones man was looking at her hard. Now he reached into the hatch of his vest and fetched out a couple of cigars, everlasting big ones, with gilt bands on them. A narrow strip of cloth or other material on clothing, to bind, strengthen, or ornament it. A strip along the spine of a book where the pages are attached. A belt or strap that is part of a machine. (architecture) A strip of decoration. A continuous tablet, stripe, or series of ornaments, as of carved foliage, of colour, or of brickwork. In Gothic architecture, the moulding, or suite of mouldings, which encircles the pillars and small shafts. (in the plural) Two strips of linen hanging from the neck in front as part of a clerical, legal, or academic dress. (physics) A part of the radio spectrum. (physics) A group of energy levels in a solid state material. (especially US) A ring, such as a wedding ring (wedding band), or a ring put on a bird's leg to identify it. (medicine) Short for band cell. (transitive) To fasten with a band. (transitive, ornithology) To fasten an identifying band around the leg of (a bird). Translations to be checked‌: "translations to be checked"
From Middle English band, from Old French bande, from Old Occitan banda (“regiment of troops”), perhaps from Frankish *bend, from Proto-Germanic *bandiz, from Proto-Indo-European *bʰendʰ- (“to tie; bond, band”). 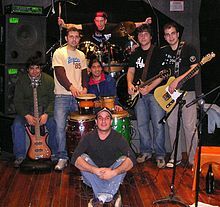 A group of musicians who perform together as an ensemble, usually for a professional recording artist. A type of orchestra originally playing janissary music. A group of people loosely united for a common purpose (a band of thieves). But in the meantime Robin Hood and his band lived quietly in Sherwood Forest, without showing their faces abroad, for Robin knew that it would not be wise for him to be seen in the neighborhood of Nottingham, those in authority being very wroth with him. "My third command to the Winged Monkeys," said Glinda, "shall be to carry you to your forest. Then, having used up the powers of the Golden Cap, I shall give it to the King of the Monkeys, that he and his band may thereafter be free for evermore." (anthropology) A small group of people living in a simple society. (Canada) A group of aboriginals that has official recognition as an organized unit by the federal government of Canada. (intransitive) To group together for a common purpose; to confederate. C: Bin1 deoi6 ben1 sin1? A: Indeed, they didn't mention which band. We... We said that we were going to form a band! The guitarist is usually the center of a band and has to lead the band during performances, and naturally becomes the audience's center of attention. From Old Norse bann (“ban, curse”). From bande (“swear, curse”), from Old Norse banna (“ban, curse”). From Middle Dutch bant. This etymology is incomplete. You can help Wiktionary by elaborating on the origins of this term. From Old English bend, from Proto-Germanic *bandiz; vocalism is influenced by Old Norse band and Old French bande. That which obstructs one's free will and free action; a restraint. A chain or other object used to restrain a captive. Captivity; the condition of being jailed. A rope or piece of twine used to tie or bind. A metal band that surrounds an object in order to strengthen it. (anatomy, rare) A joint or sinew. (heraldry, rare) A diagonal stripe or band. (rare) A strip of a material not used to tie or bind. Something used to join or connect; a link. (figuratively) A metaphorical connection or linkage. A collection or group of bound items. “bō̆nd (n.)” in MED Online , Ann Arbor, Mich.: University of Michigan, 2007, retrieved 2018-05-25. “band” in The Bokmål Dictionary. From Old Norse band, akin to English bond. “band” in The Nynorsk Dictionary. band in A Concise Dictionary of Old Icelandic, G. T. Zoëga, Clarendon Press, 1910, at Internet Archive.